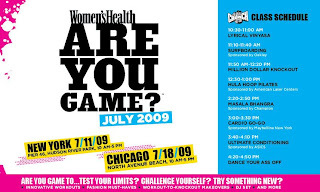 Beauty & All That: Women's Health Magazine presents "Are You Game?" "Are You Game?" Be sure to check out this free workout event in New York City this Saturday, July 11, 2009. If you're in the Chicago area, check it out on July 18. Women's Health magazine is sponsoring this fantastic day for everyone to enjoy. You will get to try beauty spa treatments and different, fun workouts that will keep you moving and get your heart racing, such as Million Dollar Knockout (11:50AM) and Cardio Go-Go (3PM).